Today we had a Samichlaus event in the Silicon Valley, organized by the local Peninsula Swiss Club. It's a nice family event celebrated in the beginning of December. 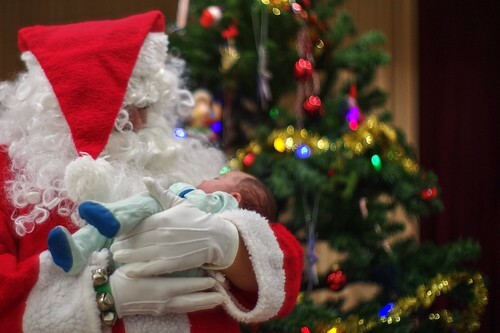 In this photo, Samichlaus is holding a 5 weeks old baby. The event is based on an old Swiss tradition, where kids receive gifts from Samichlaus, who is living deep in the forest. Based on the tale, the old man is watching kids throughout the year to see if they behave properly. Back in Switzerland, Samichlaus has a helper called the Schmutzli. Schmutzli, dressed in black, may punish naughty kids with a broom. Schmutzli was not visiting us, to the delight of the kids. I took this photo with the vintage Dream Lens at f/0.95, which gives this soft look, and distinct bokeh. I processed a balanced HDR photo from a RAW exposure, and carefully adjusted the color balance, curves and saturation.